AOMORI - The mayor of a town in northeastern Japan said Wednesday that he has called on the U.S. military to suspend operations by F-16 fighter jets stationed at Misawa Air Base in the region, after one of them dumped fuel tanks in a town lake following an engine fire. Koji Ebina, mayor of the Aomori Prefecture town of Tohoku, made the request during a meeting with Col. R. Scott Jobe, commander of the U.S. base, after the F-16 jettisoned its two external fuel tanks into Lake Ogawara in Aomori Prefecture. “We have lots of fishermen. One wrong step could result in a catastrophe,” Ebina told reporters Wednesday. Local fishermen said the tanks dropped 200 to 400 meters away from clam boats that were operating at the time. The engine fire occurred Tuesday morning immediately after taking off. The fighter jet then jettisoned its fuel tanks before returning safely to base. Since being dumped, the fuel tanks have created oil slicks in the lake, sparking safety concerns among locals. Following the incident, the local fishery association decided to totally halt fishing until the fuel oil is cleaned up. The town also decided on Wednesday to demand compensation from the central government for losses incurred due to the fishing suspension, and to examine measures to protect their lives. “We will do our best to acquire compensation as soon as the amount of the damages and fishing suspension days are determined,” the mayor said. Meanwhile, Aomori Gov. Shingo Mimura criticized the U.S. military’s claim that the tanks were dumped after confirming that the area was unpopulated, even though clam fishermen were on the lake at the time of the incident. “We were just one step away,” said a 52-year-old fisherman who witnessed the jettisoning of the tanks from his boat. One senior official of Japan’s Self-Defense Forces said it was possible to check the situation on the lake by tilting the jet forward, but he could see the logic of the actions taken. “The F-16 has only one engine so if it stops working, it’s over. So the jet needs to be lightened immediately to land,” the official said, speculating that the pilot had no time to fly over the Pacific Ocean and that the decision to jettison the tanks into the lake was a result of following protocol. But another senior official expressed doubt. About 40 F-16 fighter jets are stationed at Misawa Air Base along with patrol and transport aircraft, which fly around the area some dozen times daily. The base is deemed to be a potential dispatch point for the U.S. military aircraft in addition to Kadena Air Base and Marine Corps Air Station Iwakuni — in the prefectures of Okinawa and Yamaguchi respectively — in the event of an emergency on the Korean Peninsula. 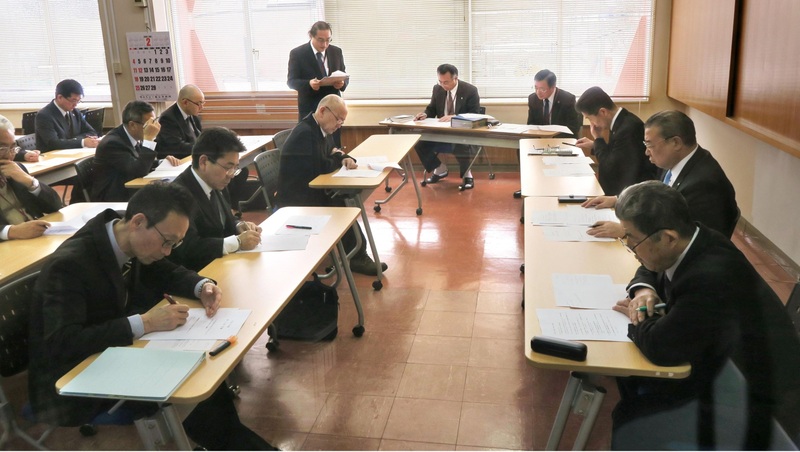 In Tokyo, Toshihiro Nikai, secretary-general of Prime Minister Shinzo Abe’s Liberal Democratic Party, and Yoshihisa Inoue, Nikai’s counterpart in the ruling coalition partner Komeito, agreed to urge the government to take measures, including the payment of compensation. Chief Cabinet Secretary Yoshihide Suga expressed the government’s readiness to comply with the request, saying at a news conference, “If fishery damages are confirmed, we will investigate the actual conditions and deal with the matter appropriately.” The latest case “has caused great fear to the people of the local fishery association and should not have taken place. We will provide relevant municipalities with any new information we get,” the top government spokesman said. The fuel tank incident followed a series of mishaps and accidents involving U.S. military aircraft in Japan, mostly in the southern prefecture of Okinawa where the bulk of U.S. military facilities in the country are hosted. U.S. military helicopters made at least three emergency landings in Okinawa Prefecture in January alone, and in February a part of U.S. Osprey tilt-rotor aircraft was found in the prefecture’s city of Uruma, on Ikei Island. On Dec. 13, a window from a U.S. military helicopter fell onto a school playground in Okinawa. At the time of the incident 54 pupils were participating in playground activities. The Okinawa Prefectural Government demanded suspension of U.S. military flights over the school, but operations were resumed after just six days.